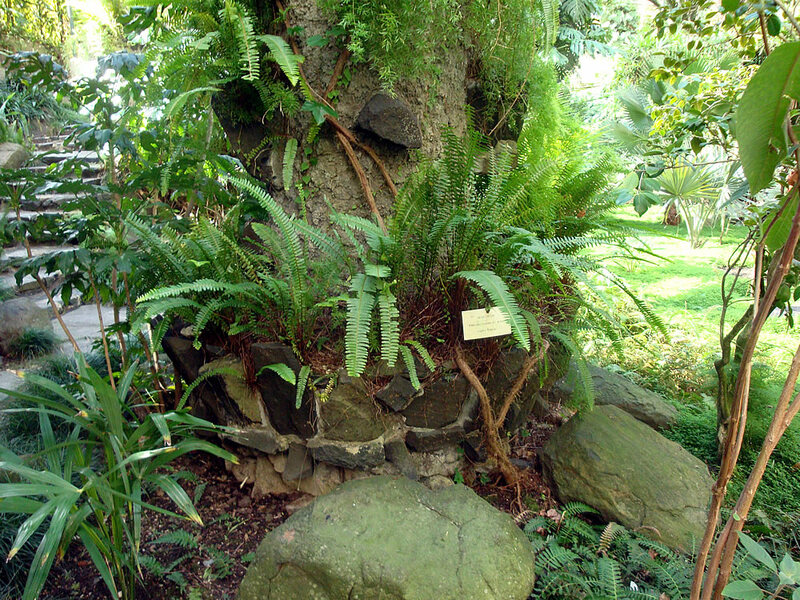 Distribution and habitat: Nephrolepis exaltata ferns grow in jungles in Central and South America where they are shaded by the jungle canopy but receive moisture on a regular basis. Within Nephrolepis exaltata genus there are many varieties, some of them quite small and compact, others quite large. These evergreen terrestrial or epiphytic ferns have short rhizomes and usually wiry spreading runners. It is considered as being a serious invasive plant, forming dense monocultures. Description: Nephrolepis exaltata has 50–250cm (20-98 inch) long and 6–15cm (2-6 inch) broad in tufted clusters arising from underground rhizomes. The individual pinnae (leflets) are as much as 2 to 8cm (1-3 inch) long and shallowly toothed, but not further divided. The pinnate vein pattern is also visible on these highly compound leaves. The round sori (clusters of spore-bearing organs) are in two rows near the margins on the underside of the pinnae. The fronds grow upright at first, then arch gracefully downwards. They grow in lovely arching rosette shaped and spread by runners. 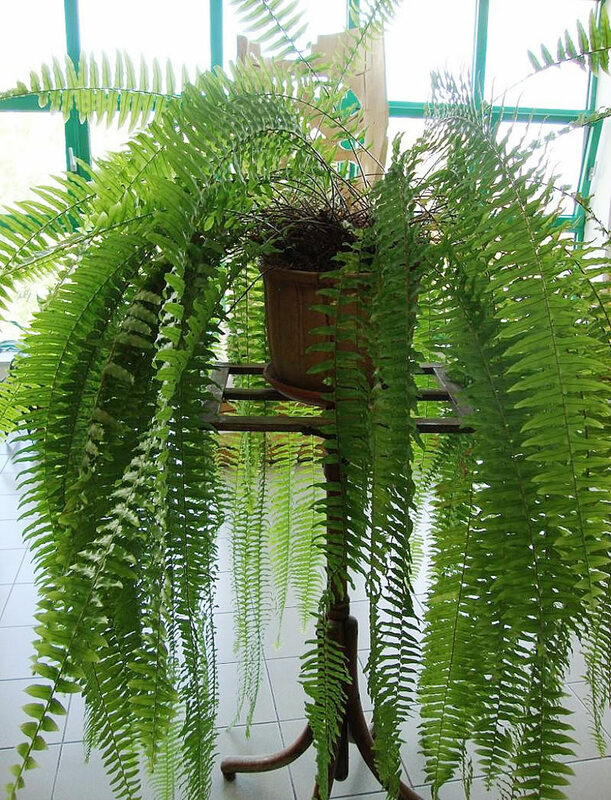 Houseplant care: Nephrolepis exaltata is one of the easiest of the ferns to grow indoors. These ferns need pliantly of space to develop their long fronds. Rotate the plant from time to time to ensure symmetrical growth, but as far as possible leave it undisturbed. Nephrolepis exaltata ferns do not tolerate dry air. They need high level of humidity provided by regular misting and trays of moist pebbles placed under their pots. Use trepid soft water if possible. Once a week, apply a gentle shower with trepid water. Leave them in bath to drain before returning them to their usual place. In some of the extremely feathery forms of Nephrolepis exaltata Bostoniensis some of the fronds of the plant occasionally revers to the original species. Cut out any long, insufficiently segmented fronds as soon as they appear. If permitted to survive, they will take over the plant. Light: Provide to Nephrolepis exaltata bright light without direct sunlight. 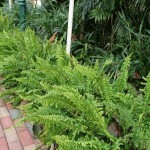 If necessary these ferns can tolerate medium light for periods up to four or five weeks. A good place for Nephrolepis exaltata is in front of an east-facing window or several feet from a west or south facing window. Temperature: Normal room temperatures are suitable throughout the year. Minimum tolerable temperature is 10°C (50°F). For Nephrolepis exaltata grown at temperatures above 21°C (70°F) increase humidity by standing the pot on a tray of damp pebbles and mist-spraying the foliage daily. Nephrolepis exaltata may appear totally dead due to frost, it will re-emerge in the spring. 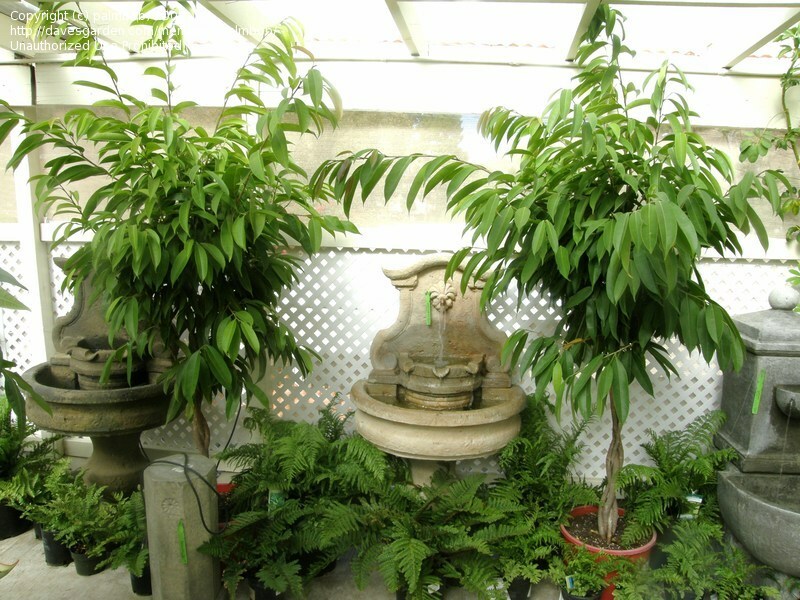 Watering: In summer Nephrolepis exaltata will need lots of water and frequent misting. As long as room temperatures remains above 13°C (55°F), water the plant plentifully as often as necessary to keep the potting mixture thoroughly moist. Do not allow the potting mixture to dry out. In winter this fern will need less water. If the temperature drops below 13°C (55°F) for more than a day or two, allow the top third of the potting mixture to dry out completely between waterings. Water hanging baskets ferns by plunging in a bath or bucket of water, to cover the soil surface. Let it to absorb water for 15-30 minute. Fertilising: Apply standard liquid fertiliser every two weeks to Nephrolepis exaltata actively growing in peat-based potting mixture. Feed actively growing plants that are in soil based mixture about once every four weeks. Potting and repotting: Use either a standard peat-based potting mixture or a combination of half soil based mixture and half leaf mould. When the roots of Nephrolepis exaltata have filled its current pot, repot in the spring, moving the plant into a pot only one size larger. After maximum convenient pot size has been reached, remove the plant from its pot every spring, carefully trim away some of the outer roots and replace the plant in the same pot, which has been thoroughly cleaned. Add fresh mixture as required. Gardening: Nephrolepis exaltata requires little maintenance, except to keep it in check from spreading too far and too fast, which it does by way of its underground rhizomes. Nephrolepis exaltata is killed to the ground by frost but will re-emerge in spring. Location: Nephrolepis exaltata are easily grown in mild areas in part shade or full shade. Plant them in bright indirect light with no direct sun. Soil: Nephrolepis exaltata grows well in humus-rich soil. Good drainage is mandatory. Amend heavy clay or sandy soils with organic matter. 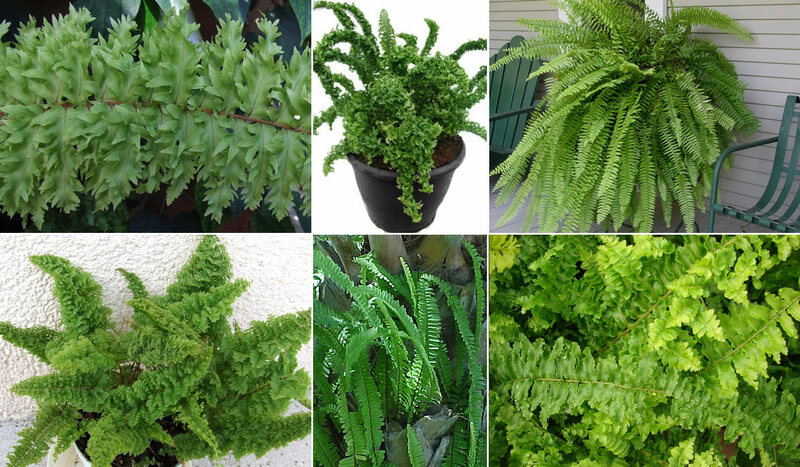 Irrigation: Follow a regular watering schedule as these ferns need moist soil and steady high humidity. Water them slowly and deeply, allowing the substrate to dry slightly between waterings. It is best to water early in the day to allow the fronds plenty of time to dry before night time. Ferns need to be kept consistently moist at all times. They do not however want to be soggy or water logged. Nephrolepis exaltata is the most drought tolerant of the commonly cultivated ferns, but it thrives only under conditions of high humidity. Mulches them to help reduce water evaporation in hot or dry weather. Fertilising: Nephrolepis exaltata thrives best when are added 5-8cm (2-3 inch) of compost or peat moss to the beds each spring or fall. This treatment should suffice and no additional fertilising is require. Adding controlled release fertiliser on the soil surface should be done at low rates, as recommended on label. 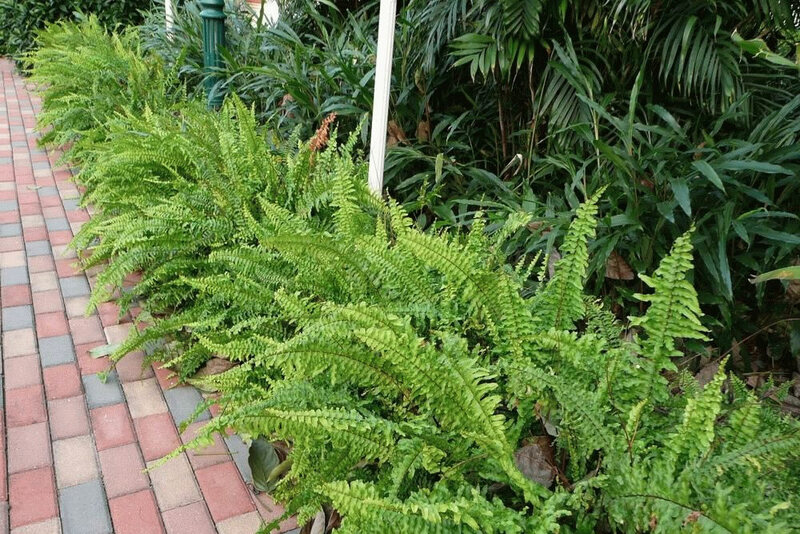 Ferns are sensitive to high salt levels, so moderation should be considerate when decide to fertilise them. Propagation: Nephrolepis exaltata plant is usually propagated by division of the rooted runners, as named cultivars will not produce true spores. Propagate whanever desirable by potting up a new plantlet taken from any point where the tip of a runner has rooted down. Use a sharp knife to cut through the runner about 5cm (2 inch) from the tip, thus releasing the rooted plantlet. Plant it in a 8cm (3 inch) pot of the preferred potting mixture for adult plants and treat it in the same way as a mature specimen. Nephrolepis exaltata will shed fronds if potting mixture dry out, at which point all fronds may be cut back to about 5cm (2 inch) to regenerate. Pythium or Phytophthora: Symptoms include stunting, wilting, and graying or yellowing of the foliage. More likely to occur in cool, dark weather and cool, wet media. Treatment: Fungicides remain an important method to control losses due to Phytophthora and Pythium spp. Rhizoctonia: Aerial blight that occurs mostly in the summer. Symptoms include brown irregular lesions commonly in the crown of the plant. Treatment: Apply adequate fungicides. Be certain the Nephrolepis spp. to be treated is listed on the fungicide label. Oval or round brown spots indicate fern scale. Treatment: It the attack is mild remove the insects with a cotton swab dipped in diluted methylated spirits. Combat major attacks with a suitable insecticide. Care should be taken as some of these insecticides are not suitable for ferns. Grey, pale or crumpled fronds indicate an attack of red spider mites. Treatment: Submerge the whole plant in a bath of trepid water for 10 minutes. Drain well, keep evenly moist and mist to keep humidity high. Place the plant in good light. Mites are only comfortable in hot dry surroundings, so will perish if these conditions do not exist. Small white insects on fronds occur if the plant is host to mealy bugs. Treatment: Mild attacks can be dealt with using cotton tipped swabs dipped in diluted methylated spirits. Combat severe attacks with careful use of a suitable insecticide. Follow the label instruction for use. Lifespan: Give to Nephrolepis exaltata good light and adequate humidity and it will grow for many years. 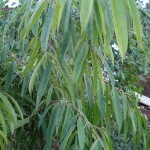 Availability: Nephrolepis exaltata are available all year from garden centres and nurseries. Buy fresh green looking plants of a reasonable size. Note: Nephrolepis exaltata is classified as an invasive alien plant in South Africa. In some provinces it must, by law, be eradicated. In others, a permit is required to import, possess, grow, breed, move, sell, buy or accept one as a gift. Recommended varieties: Nephrolepis exaltata cv. Bostoniensis has gracefully arching wavy or curly fronds. It is one of the oldest and probably the most popular variety. Uses and Display: A mature Nephrolepis exaltata, with its cascading mass of fronds will look impressive in any settings. Stand it on a medium height cane table to create a nostalgic hint of the Victorian era when ferns were more popular than today. Also Nephrolepis exaltata are ideal plants for hanging baskets. But remember that hanging baskets tend to dry quickly, so check the potting mixture to not dry out. Many prefer to keep the ferns in bathrooms, but only do this is the light is bright. Small plants will fit onto windowsills but larger ones will need more space and should be place a little further into room. It is used as a specimen or accent plant in large containers. 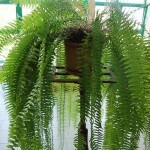 Hanging baskets are often filled with this fern. Nephrolepis exaltata is a perennial hardy plant used in warm climate zones as erosion control plant, ground cover, massing or woodland garden. It is used in landscape along walks, in front of taller growing shrubs and as a ground cover under trees. Nephrolepis exaltata is acting as a natural air humidifier, removes formaldahyde and is a general air purifier. It said to be among the best in air purifying houseplants. 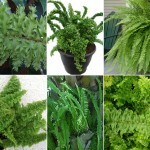 On the other hand, these ferns are known to be non-toxic, so it is safe to grow them around kids and pets. Distribution and habitat: Spathiphyllum wallisii is one of approximately 40 species in a genus of tropical evergreens. It is growing wild in tropical regions of Central America, usually found in wet habitats. 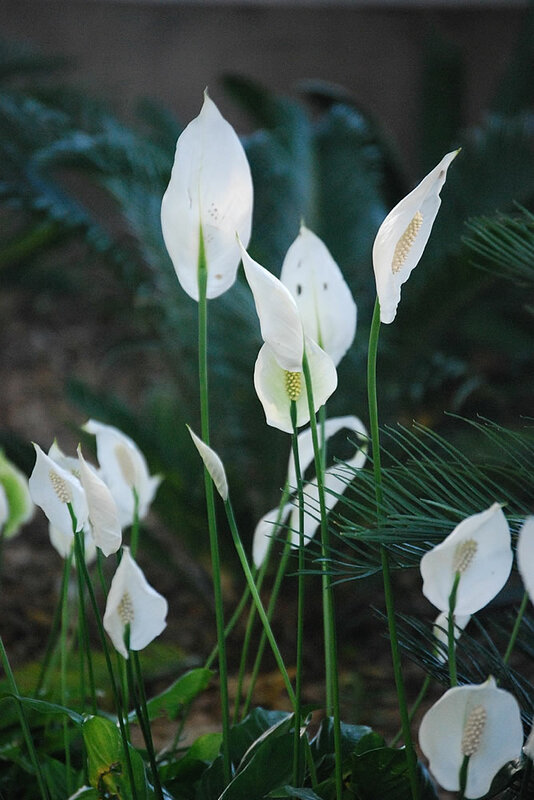 Its natural habitat are the rainforests, in the shade of larger trees, where Spathiphyllum wallisii receive very little direct sunlight and have adapted to live in low-light conditions. Their native environment stays between 21 and 32°C (70-90°F) year round and receives as much as 10000mm (400 inch) of rain annually. Decsription: Spathiphyllum wallisii are almost stemless, evergreen, perennial plants with short underground rhizomes that send up clusters of lance-shaped or elliptic, dark green leaves on sheathed leaf-stalk. These plants are grown for their glossy leaves, brilliant spathes and scented flowers. Its leaves, on 15cm (6 inch) long stalks, are 15cm (6 inch) long and 8cm (3 inch) wide and strongly veined, arching away from the base of the plant, making this an attractive foliage plant even when not in bloom. Flower heads arising from centres of leaf clusters are produced mainly in spring and often again in late summer on 20-25cm (8-10 inch) long stalks that tower above the foliage. 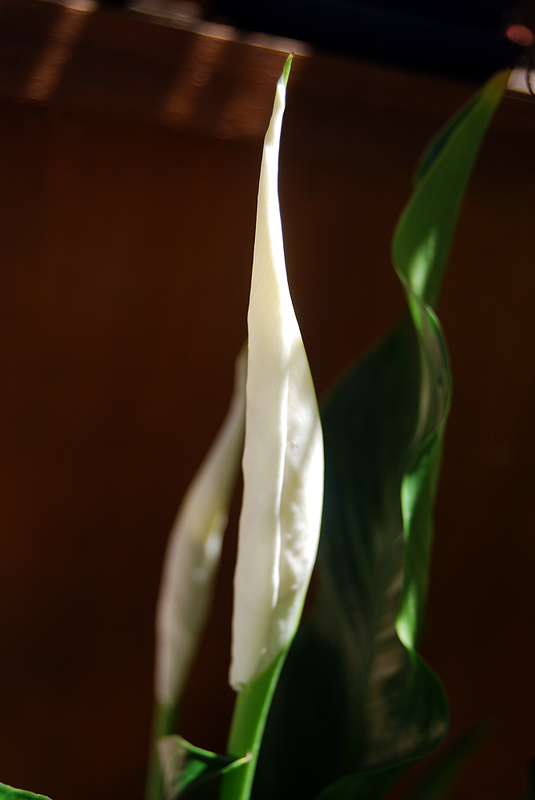 Each flower head consist of a large white spathe surrounding an erect, 5-7cm (2-2.5 inch) long spadix cream coloured. The spathe is pointed-oval, 7-10cm (2.5-4 inch) long and 5-7cm (2-2.5 inch) wide. The usually fragrant flower head keeps its original colour for only about a week. 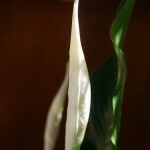 The spathe gradually change from white to light green and remains attractive for a further five to six weeks. It then begins to become unsightly and is best removed. 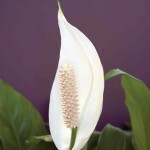 Spathiphyllum wallisii is the only true species commonly grown indoors, rarely grows more than 30cm (12 inch) high. Houseplant care: The plants can naturally withstand abuse since they must live through the dry season in their native habitat which at times requires them to survive when little water is available but they do have limitations and cannot withstand perpetual abuse and neglect in a home. Growth rates of Spathiphyllum wallisii are slow to medium. When flowers start to fade, cut off the flower stalks as close to the base as possible. 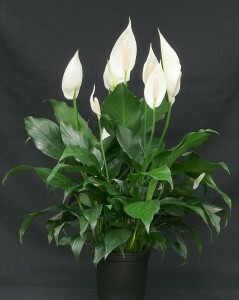 Light: Grow Spathiphyllum wallisii is medium light. Direct sunlight will burn the leaves. This plant will tolerate low light, but may bloom poorly. Temperature: Normal room temperatures are suitable for these plants (18-24°C (64-75°F)). Minimum tolerable temperature is 10°C (50°F). In temperatures of 18°C (64°F) and above there is unlikely to be a noticeable rest period. Growth may slow down during the winter, however. Humidity: Spathiphyllum wallisii are particularly sensitive to dry air and should be kept on trays of moist pebbles throughout the year. The leaves should also be mist-sprayed frequently. It needs a relative humidity of 40% or higher. Watering: Water moderately, enough at each watering to make the potting mixture moist throughout but allowing the top centimetre (0.4 inch) or so of the potting mixture to dry out before watering again. If the temperatures falls below 15°C (59°F) for more than a day or two, reduce the quantity of water, making the potting mixture barely moist. It is important never to let the potting mixture dry out completely. Feeding: Apply standard liquid fertiliser every two weeks from early spring to late autumn (when Spathiphyllum wallisii grow most actively). Continue feeding throughout the year for plants that are actively growing in peat-based mixture. Potting and repotting: Use either a peat-based potting mixture or an equal-parts combination of soil-based mixture, leaf mould and coarse sand or perlite. Move plants into pots one size larger every spring until the maximum convenient pot size (probably 15-20cm (6-8 inch)) has been reached. Thereafter, it will be enough to top dress plants annually with fresh potting mixture. This plant likes to be slightly pot-bound. Divide it every 5 years or when necessary. 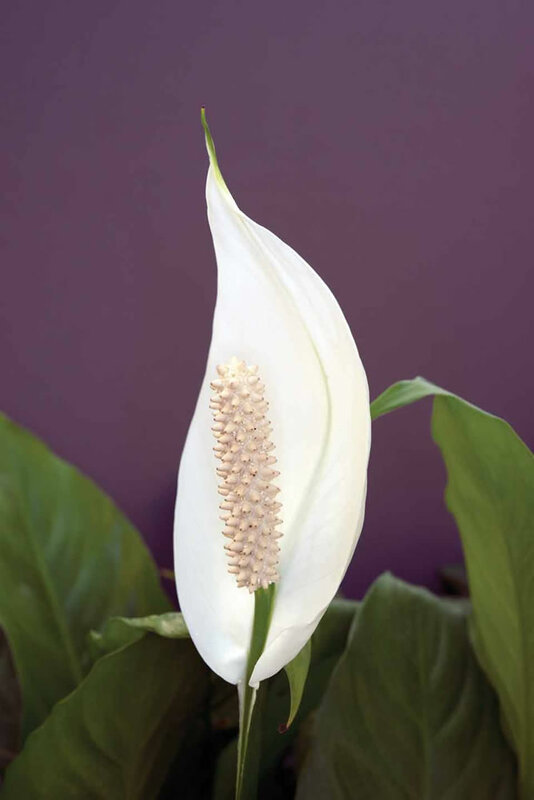 Gardening: Spathiphyllum wallisii are intolerant of full sun or elevated salinity levels. Avoid drying winds, exposure to salty water and direct sun. Plant it into the ground only within its hardiness zones, otherwise use potted plants or transplant them into the pots in autumn when the temperatures drop below 10°C (50°F). Location: Use this plant in a partially or fully shaded location in the landscape, protected from high wind. This plant can be used as a ground cover in completely shady areas of the landscape. Soil: Outdoors Spathiphyllum wallisii plants should be grown in fertile acidic to neutral loamy organic soils with a steady but well drained moisture supply. Irrigation: Water thoroughly, but do not allow the soil to get soggy. In dry areas, provide copious amounts of water or place the plant near a pond to keep the humidity high. A low spot that is naturally damp but still has adequate drainage is an ideal location for Spathiphyllum wallisii. Fertilise: Fertilise this plant regularly during the growing season to maintain a dark green foliage color. Use a liquid fertiliser once a month. Propagation: Propagate the Spathiphyllum wallisii in spring by dividing overcrowded clusters of leaves. Pull rhizomes apart gently, making sure that each piece has at least two or three leaves attached. Plant individual pieces in 8cm (3 inch) pots of either of the recommended potting mixture, burying each piece at the same depth as the entire rhizome was planted. Do not apply any fertiliser to the newly potted rhizome sections for three months. Otherwise, treat them as mature Spathiphyllum wallisii. Red spider mites will attack Spathiphyllum wallisii if the humidity is low. Mist-spray the foliage at least once a week, concentrating on leaf-undersides, which is where these mites collect. Plants will deteriorate rapidly if the minimum temperature is not maintained. Brown leaf tips are likely caused by overwatering. It could also be caused by direct sun. Treatment: Move the plant to a shadier spot and be careful not to overwater. A plant is likely to be overfertilised if the leaves end up with brown spots on them. Treatment: Stop fertilising the plant. Flush the potting mixture with plenty of water to wash salt deposited on the roots taking care to drain the excess water from the drip tray. If the leaves become shriveled and dry, the humidity is too low. Treatment: Increase humidity by misting the plant or placing it on a tray of wet pebbles. Spathiphyllum wallisii plants that fail to bloom usually are not getting enough sunlight. Treatment: Move the plant to a brighter location, but keep it out of direct sun which can scorch leaves. Also, when old plant which has not been divided in several years and refuse to bloom, divide it in spring. This is one of the few plants that blooms better after dividing it. 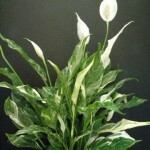 Spathiphyllum wallisii ‘Domino’ is a medium growing Spathiphyllum wallisii with beautiful variegate foliage. Spathiphyllum ‘Domino’ has contrasting bright white and dark green leaves. It has a bushy habit of growth. Spathiphyllum wallisii ‘Mauna Loa’ is an hybrid that can grow 60cm (24 inch) high with larger spathes and oblong lanceolate leaves. Flowers appear at almost any time throughout the year and last up to several months on plant, changing their colour from green to white to green. Toxicity: Spathiphyllum wallisii is reported to be toxic to humans, cats and dogs as most tissues contain calcium oxalates; the sap of some taxa is also a skin irritant. Keep it away from children and pets who may play with or chew on it and wash hands thoroughly after handling it. 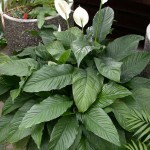 Uses and display: One of most reliable interior-scape plants, Spathiphyllum wallisii are outstanding as houseplants, conservatory or interior-scape plants, but are also a common component of tropical outdoor landscapes where they often serve as groundcovers, shade borders, or shade accents. 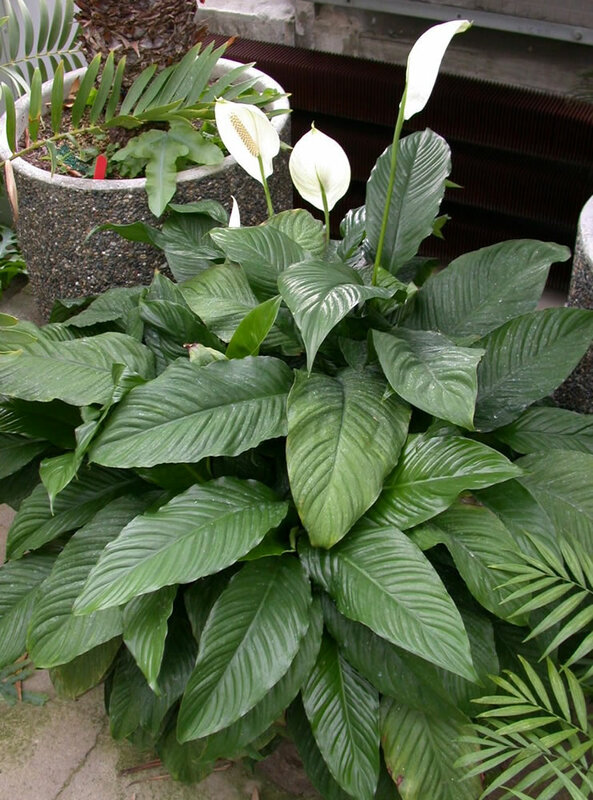 Spathiphyllum wallisii make excellent container plants for shaded patios or can be used as a summer accent in shaded annual beds. Potted plants are suitable tabletops, plant stands and as floor specimens or dish garden. This is one of the best plants for improving air quality indoors. 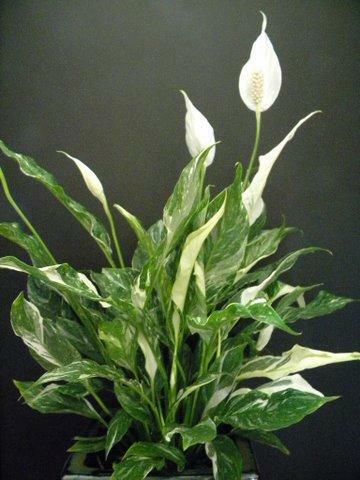 Spathiphyllum species are known for removing benzene, a common household chemical and known carcinogen. It is also said to remove mold spores in the air, making it great for bathrooms, kitchens and laundry rooms; purifying the air of trichloroethylene, a chemical found in cleaners and solvents; and removing alcohols, acetone, and formaldehyde. 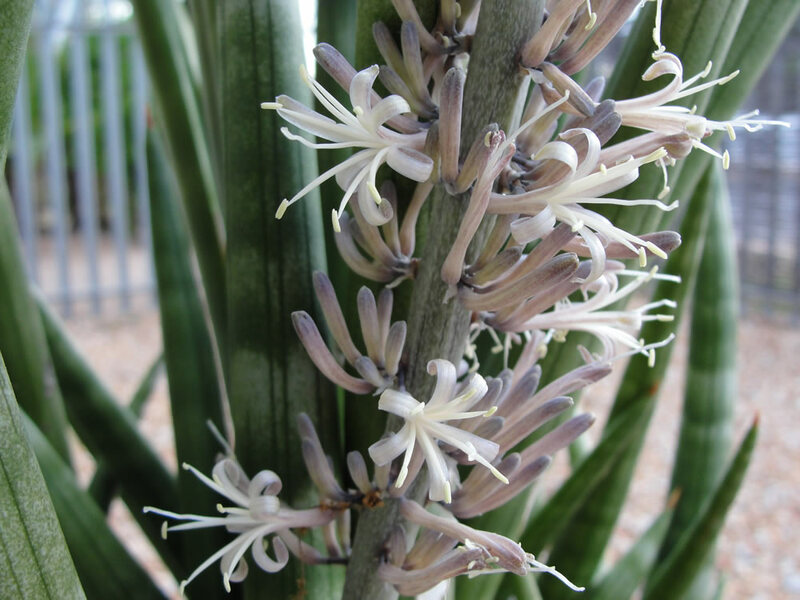 Distribution and habitat: Sansevieria cylindrica is a succulent plant native to Angola. It is an evergreen perennial plant forming dense stands, spreading by creeping rhizome, which is sometimes above ground, sometimes underground. These plants in the wild frequently form diffuse colonies. Description: Sansevieria cylindrica has striped, tubular leaves that are smooth and a green-gray colour with a dark-green striped pattern or just dark green colour in some cases. The leaves have pointed tips. A single leaf is about 3cm (1 inch) thick and grows to a height between 1 and 2m (3-7 feet). 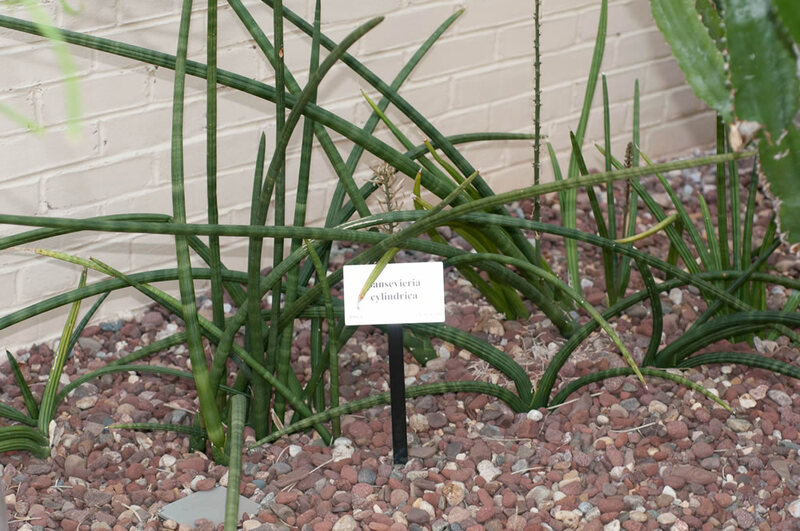 The Sansevieria cylindrica grows fan-shaped from underground rhizomes, its stiff leaves rising from a basal rosette. Plants are rigid, ribbed lengthwise and dark green cross-banded with grey-green when young. Long flower spikes may appear erratically on mature plants, arising from the base of the spears shaped leaves. The 3cm (1 inch) greenish-white tubular flowers are tinged with pink growing in clusters on an erect flower spike. 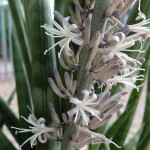 Sansevieria cylindrica tends to bloom more readily from a young age than other varieties. These flowers are not particularly showy, but they are nicely fragrant. Occasionally flowers will be followed by spherical orange-red berries to about 1cm (0.4 inch) in diameter. These interesting plants are one of the most unusual plants. The plant cylindrical spears that spring from the sandy soil can be braided or left in their natural fan shape. Best of all, they can be almost ignored and the plant will thrive. 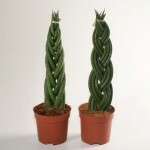 Sansevieria cylindrica are extremely long lived plants. Houseplant care: Sansevieria cylindrica is popular as an ornamental plant as it is easy to culture and take care of in a home. Truly, they thrive on neglect. One exception to this rule: their pots must be well drained. Wipe the leaves with a damp cloth to keep them dust-free. Every leaf is tipped with narrow awl-shaped point and care should be taken not to damage it; a leaf with a broken tip will stop growing. The growth is relatively slow and plants last for many years. Light: Sansevieria cylindrica likes bright light and can stand plenty of direct sunlight. They will tolerate a certain amount of shade – at a slight shaded window – without detriment to their growth, but will virtually stop growing if they are forced to live in poor light for any length of time. But, they will survive in poor light. When growing in high light, the leaves will grow more upright, desired look for a nice container plant. Temperature: As native of the tropics, these plants thrive in average to warm room temperatures; from 18-26°C (65-79°F) suits them ideally. It will tolerate fluctuating temperatures, but never subject them to temperatures below 13°C (55°F). 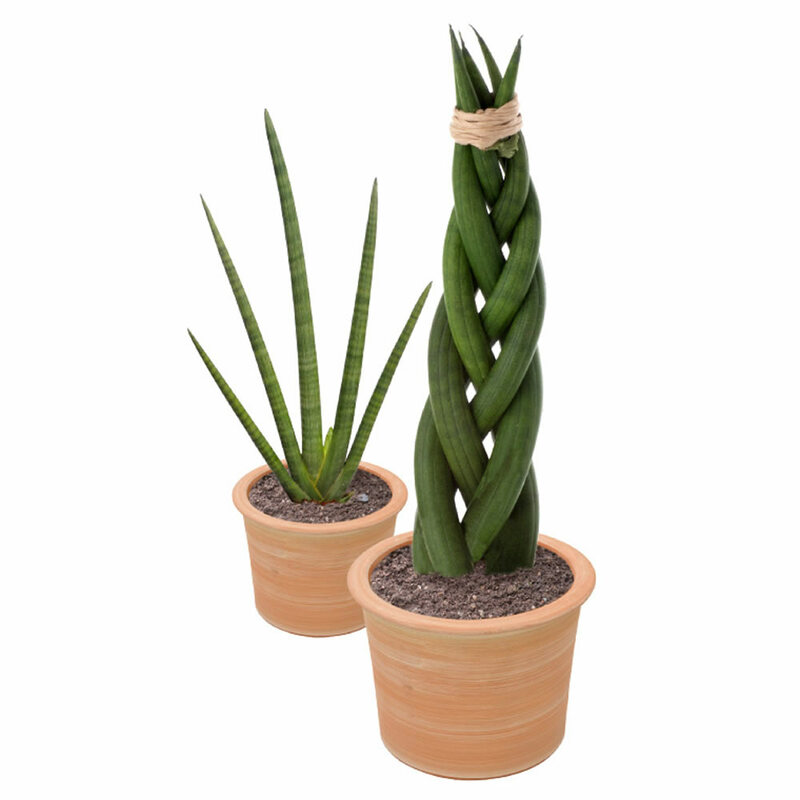 Sansevieria cylindrica will tolerate dry air, but keep it away from air vents or drafts. Average room humidity will be satisfactory for this plant. Watering: During the active growth period water only moderately, giving enough to make the potting mixture moist throughout at each watering, but allowing the top couple of centimetres of the potting mixture to dry out before watering again. During the rest period allow at least half of the potting mixture to dry out between waterings. Overwatering leads to rot and cause the leaves to topple over at the point where they join the rootstock. Water the soil, taking care not to get water on the leaves, which will cause them to rot. If the leaves turn yellow or get soft and mushy at their base, the plant is overwatered. Empty the plant saucers after watering, to avoid that stagnant water to damage the roots. The species is drought-tolerant and grown indoors it needs water only about once every other week during the active growing season. Feeding: Do not over-fertilise these plants. Apply a liquid fertiliser about once a month to all plants during the active growth period, but only at half strength. Potting and repotting: Repot in spring, only when plants get crowded and need dividing. 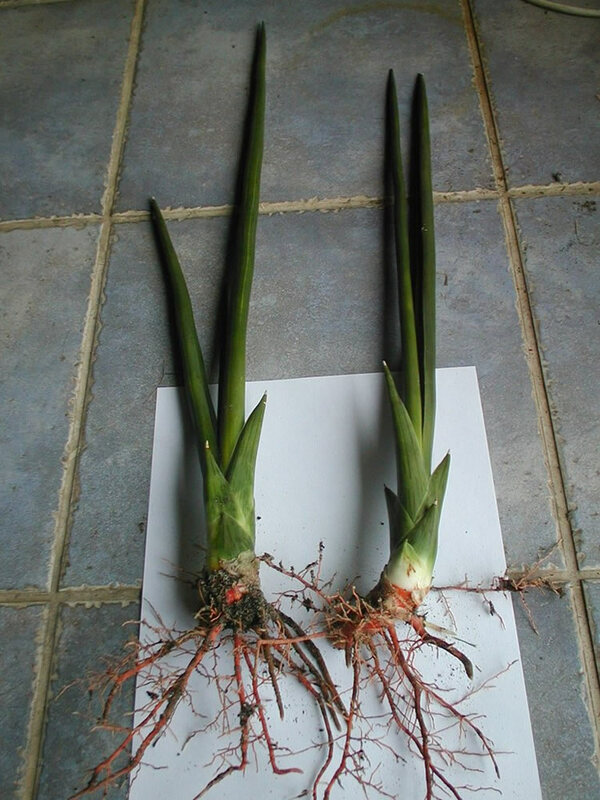 Sansevieria cylindrica do not mind cramped root conditions and so can be left undisturbed for several years. Fleshy, usually cream-coloured roots will often appear on the surface of the potting mixture, but these plants do not really need repotting until they crack their pots. Ideally, the plants should be moved on shortly before reaching this stage, when the leaves occupy most of the pot surface. Keep the rosette of the leaves at soil level. Use a wide, heavy container to prevent toppling as this tall plant tend to be top-heavy. Repotting is best done in early spring. In years when plants are not repotted, top-dress them with fresh potting mixture, first scraping away some of the loose old mixture carefully so as not to do any damage to the near surface roots. For open, quick drainage add one-third coarse sand to a soil-based potting mixture and put plenty of clay-pot fragments or other drainage material into the bottom of the pot. 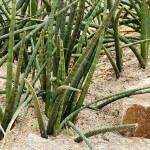 Gardening: Sansevieria cylindrica can be grown in the garden in mild to tropical climates and it is not fussy. When planting in ground space plants to allow clumps to form and develop properly. If planted too tightly there will not be enough room for root expansion and plants will not reach their full height and bloom potential. In very cold zones a containerized Sansevieria can be brought inside for the winter months, when the temperatures drops below 13°C (55°F). Plants that have been living in the shade should not be moved to a sunny position without gradual acclimatization; sudden prolonged exposure to sunlight can result in leaf burn. Position: It can be grown outdoors in partial shade. This plant needs only partial sunlight, avoiding midday direct sunshine which could cause unaesthetic burnings on the foliage. Soil: Sansevieria cylindrica needs good drainage. Plant in ground in well drained, sandy soil enriched with peaty compost. 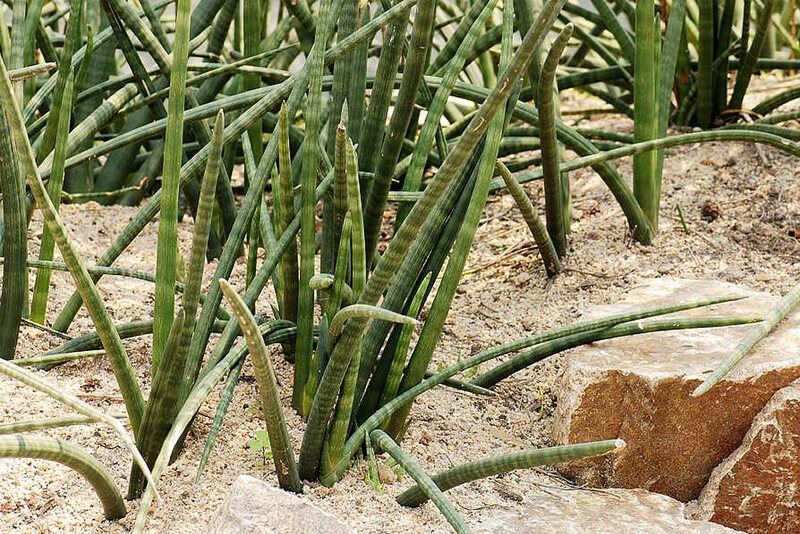 Irrigation: Sansevieria cylindrica only needs watering about once or twice a month during the warmer season and it should be kept drier in winter. This plant is very drought resistant. Do not over-water it, especially in winter. Fertilising: Mixing a small amount of slow time release fertiliser into the lower level of the soil before planting speeds up the rate of growth. However, fertiliser can be detrimental to Sansevieria cylindrica and too much can kill the plant. Use a cactus fertiliser or slow time release fertiliser once a month. These plants are light feeders, however unfertilized they will tend to grow very slow. Do not overfertilise them. Always, less is better than too much fertiliser for these plants. Propagation: Sansevieria cylindrica can be propagated by dividing up overcrowded clumps of leaves. Detach clusters of leaves from rootstock with a sharp knife when the leaves are 15cm (6 inch) long. Most clusters will have some roots attached and can be planted directly in the normal potting mixture; those without roots will root quickly in a mixture of peat moss and sand. Sever suckers from the parent can be done when two or there leaves have been formed. Also, these plants can be propagated by leaf cuttings. Slice leaves crosswise into 5cm (2 inch) long pieces, remembering which is the top and which is the bottom because cuttings must be planted right end up. Push three or four leaf sections about 1-2cm (0.4-0.8 inch) into a moistened mixture of peat moss and sand in an 8cm (3 inch) pot, place them in bright light and water sparingly, just enough to make the potting mixture barely moist. Eventually, rhizomes will be produced, but it is a slow process. 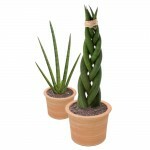 Problems: Any problems with growing Sansevieria cylindrica are usually related to watering. Allow the soil to dry out between waterings. If in doubt, keep it on the dry side. The only things that will kill this plant is soggy soil and prolonged exposure to cold temperatures. Rotting at the base with leaves yellowing and drying back is normally due to overwatering. Treatment: If part of the plant is still healthy, cut this away, repot and keep it warm and dry. Curling leaves are the result of underwatering in summer. Keep a careful watch for vine weevils which often eat pieces from the edges of leaves, causing irremediable damage. Treatment: Pick up and destroy adults. Plants with badly damaged roots cannot usually be saved. Immediately on sighting an adult weevil, drench the potting mixture with a suitable pesticide. Note: Watch out for the pointed tips of Sansevieria cylindrica cylindrical leaves as they are sharp. 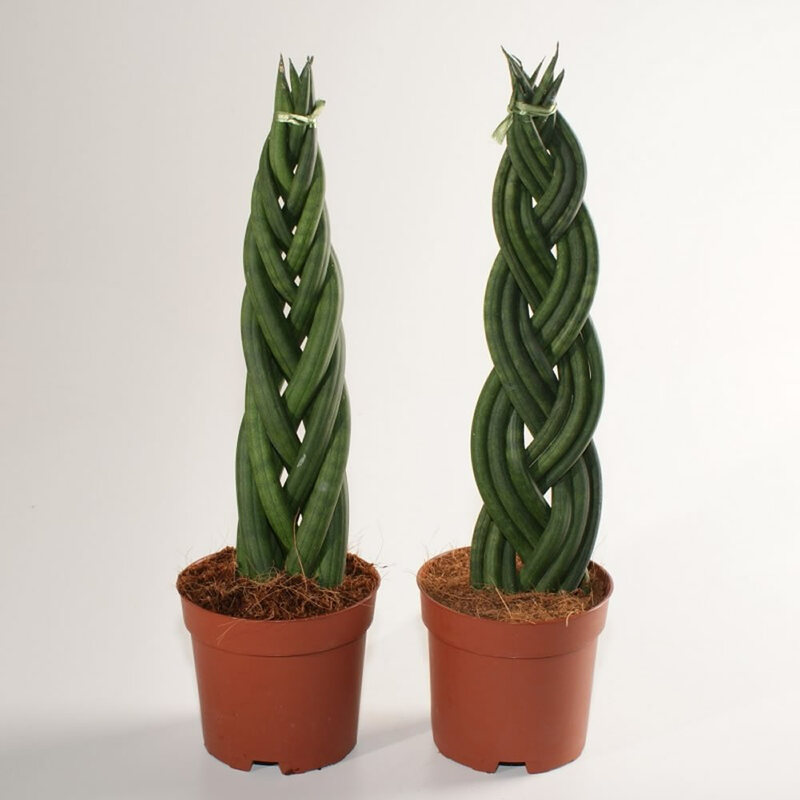 Uses and display: Sansevieria cylindrica are a tall growing kinds very decorative in grouping, where they can be used to provide compact vertical contrast with different kinds of lower growing bushy or rosette-shaped plants. 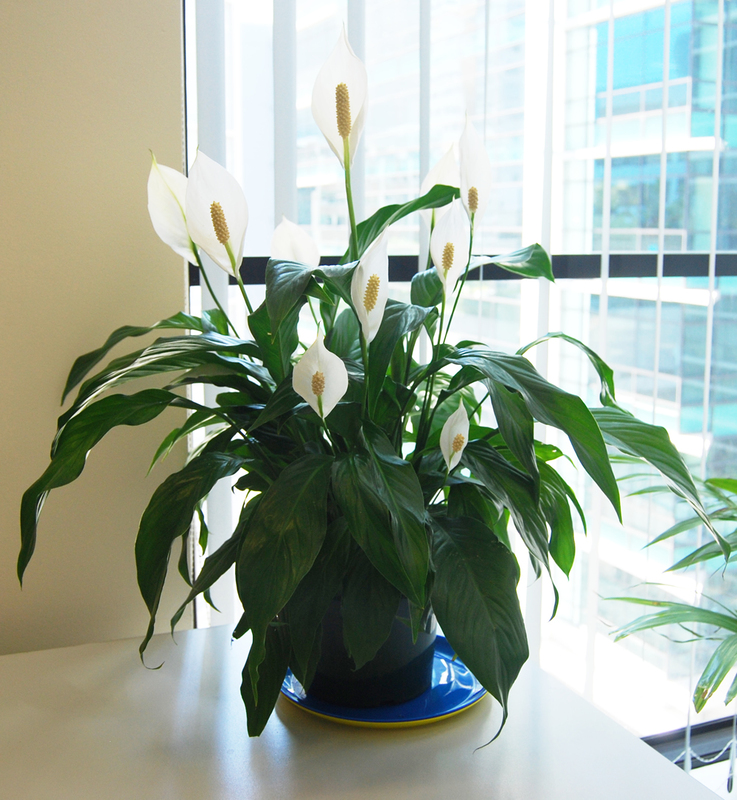 Its easy-going nature and tolerance of dry air and soil also make it a reliable office plant. The appearance of these plants is greatly enhanced by an attractive pottery container. This plant can be used with equal effectiveness as an accent plant or in mass in planters or beds. Sansevieria use the crassulacean acid metabolism process, which absorbs carbon dioxide and releases oxygen at night. This purportedly makes them suitable bedroom plants. However, since the leaves are potentially poisonous if ingested, Sansevieria is not usually recommended for children’s bedrooms. Sansevieria species are believed to act as good air purifiers by removing toxins (such as formaldehyde, xylene and toluene) from the air, thereby gaining a reputation as a good cure for sick building syndrome. Distribution and habitat: Hoya carnosa is one of the many species of Hoya that are native to Eastern Asia and Australia. Hoya carnosa grow in lowland tropical rainforests where they wrap around or hang high in the trees. They are semi-epiphytic (not parasitic) and like constant moisture (around 5000mm (200 inches) of rain per year) and high humidity. In wild, Hoyas that climb more often they not start growing at ground level, gradually working their way upwards towards light or others scrambles over rocks, growing continuously and reaching lengths of 6m (20 feet) or more. Description: Hoya carnosa is a fast growing climber with glossy, elliptical, dark green leaves 8cm (3 inch) long and 2cm (0.8 inch) wide. The leaves grow in opposite pairs and have short leaf-stalks. Hoya carnosa is a common house plant grown for its attractive waxy foliage and sweetly scented flowers. Flowers are growing in clusters of convex umbel of 10 to 30 are white to very pale pink, always with red centre. The flowers are star-shaped and their surface are covered in tiny hairs giving them a fuzzy sheen appearance. They are 1-2cm (0.4-0.8 inch) wide carried on a woody spur about 2cm (0.8 inch) long which arises from the leaf axil. The long lasting clusters of flowers are produced every year – normally throughout the summer – on 3-5cm (1-2 inch) long stalk. These flowers which last about one week produce lots of nectar and have a strong sweet fragrance that it can fill an entire room at night. 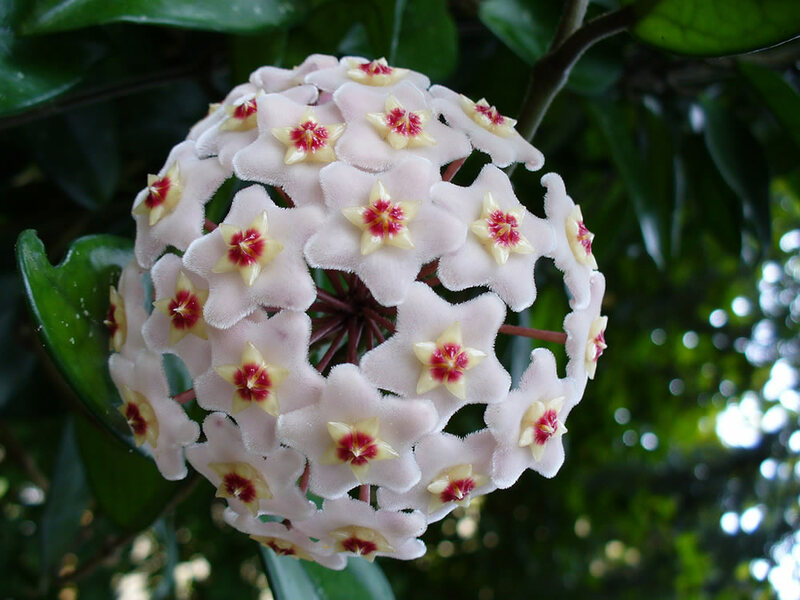 Houseplant care: Hoya carnosa is one of the easier Hoya to care for. It can tolerate the drying climate of a room better than other members of the genus and it is less vulnerable to cold temperatures. 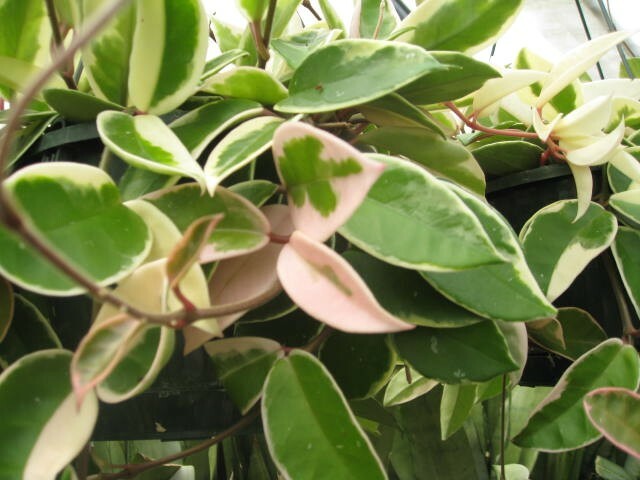 When grown indoors – the climbing Hoya carnosa can grow quite tall – are usually grown on small trellises or are trained around wire or stakes. When is young and small look attractive when grouped together in a hanging basket. The flowers sometimes drip sticky honeydew that could make mess on furniture. Allow the flowers to dry and fall off on their own. Hoya spurs produces flowers year after year. By removing spurs (little leafless stem) will has as effect a reduced flowers quantities for the future. The plant’s long vines can be pruned back to keep it compact or instead, prune the main stem to encourage more side shoots that may produce flowers later. The best time to prune is early spring, before Hoya carnosa start their most vigorous time of growth. Light: Three to four hours a day of sunlight are essential for healthy growth and flowering. Harsh afternoon sun can burn the leaves, so it is best to place the plant where it will receive early morning or late afternoon sun. Place Hoya carnosa plant in a sunny, south- or west-facing window for the best results. Also, Hoya carnosa will grow well in artificial light. If a Hoya carnosa is mature but has not bloomed, it is usually because it is not getting enough light. Keep it in bright, indirect light for best results. The flowers will always face toward the brightest light. Do not turn the plant when flower buds are forming or it may abort the blooming process. Temperature: Normal room temperature are suitable for these plants. Keep the air temperature above 10°C (50°F) in winter and provide temperatures of 16 to 21°C (60-70°F) in summer. Water: During the active growth period water moderately, allowing the top centimetre (0.4 inch) or so of the mixture to dry out between waterings. During the rest period water only enough to keep the mixture from drying out. Fertilising: Give Hoya carnosa a high-potash liquid fertiliser once every two weeks during the active growth period only. Potting and repotting: Use a soil based potting mixture. Move climbing Hoya carnosa into pots one size bigger each spring until maximum convenient pot size is reached. Move trailing plants on only once in two years. After reaching maximum pot size, top-dress these plants instead of moving on. Never repot a plant when it is in bloom because it may drop its flower buds. Propagation: Propagate Hoya carnosa in spring by means of stem cuttings 8-10cm (3-4 inch) long. Take each cutting immediately below a pair of leaves, dip the cut end in a hormone rooting powder and plant two or three together in a 5-8cm (2-3 inch) pot containing a moistened equal parts mixture of peat moss and coarse sand or perlite. Enclose the whole in a plastic bag or propagating case and stand in medium light until rooting occurs (normally, in six to eight weeks). Uncover the new plants and begin to water them sparingly. After future top growth appears, start regular feeding. About three months after the start of propagation move the new plants into soil-based mixture and treat them as mature Hoya carnosa. Problem: Hoya carnosa is generally trouble-free. Overwatering will result in leaves turning brown. Hoya carnosa that dry up and drop their buds have been allowed to become too dry between waterings. They will also drop their buds if the potting mixture is constantly kept too wet. 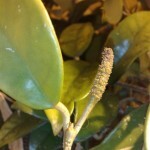 Do not move the plant when buds are forming because changes in light may cause them to drop. Raising the humidity can help. However they do not dry up in this case but become yellow and spongy or brown and mushy. The buds that open but fall off soon after are probably placed where a cool draft is hitting them, maybe from a fan. The tip ends of the new growth of Hoya carnosa dies off. The causes of stem tip burn can be: low humidity, overfertilising, stems touching a cold or hot surface. Hoya carnosa can be attacked by mealy bugs (white cottony patch) and scale insects (small brown insects that cling to stems and leaves, secreting a sticky residue on the plant). Treatment: Treat the plant against mealy bugs and scale insect with a mix of a little mild dishwashing detergent with water and spray the infected plants. The soap will coat and suffocate the insects. Rinse the plants off with clean water to make sure the pores on the leaves are open so the plant can breathe. Sometimes tiny little little black flies that fly around potted Hoya carnosa plants. These are Fungus gnats (Bradysia species). They lay eggs in the potting mix. The eggs hatch out into tiny almost microscopic worms that feed on the peat moss and often on the roots of plants. Treatment: A very small amount of a systemic pesticide watered into plants every five weeks or so, will get rid of them. Toxicity: Hoyas carnosa produce a milky sap laden with latex and are considered toxic. This does not necessarily mean they are poisonous; however, it would be best to keep them out of the reach of pets and children. 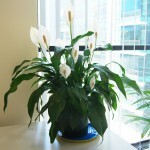 Anyone with an allergy to latex should avoid handling the plant if it is damaged. Note: Hoya carnosa has been in cultivation for more than 200 years and has given rise to many cultivars that vary in foliage form or flower color. Like all Hoyas, this species flowers from specialized perennial structures referred to as spurs. These appear from the axils of the leaves and stem; flowers may not be produced when the spurs first appear, but in time buds emerge from the tips. Each season new flowers are produced on these same spurs, so they should not be damaged or removed. Use: Hoya carnosa is usually grown indoors in hanging containers or containers that allow the plant to climb. Fold the stems back over the pot when they get too long. Flowers are fragrant. This plant is attractive to bees, butterflies and bird. Recent studies at the University of Georgia have shown Hoya carnosa to be an excellent remover of pollutants in the indoor environment. Hoya carnosa ‘Exotica’ is a variegated leaved form of Hoya carnosa. It has a broad yellow stripe down the centre of each leaf. Hoya carnosa ‘Variegata’ (Golden Wax Plant) has leaves bordered in creamy white, which may even be pink-tinged. Hoya carnosa ‘Krinkle Kurl’ called Hindu rope is one of the most commonly grown form of Hoya carnosa. The leaves of this cultivar are twisted and contorted, crowded along the stem, and folded lengthwise. Distribution and habitat: Phalaenopsis amabilis is native to Australia, Indonesia and the surrounding islands. Like other orchids, the Phalaenopsis amabilis is epiphytic, meaning it grows with air roots hanging onto trees instead of in soil. These epiphytes are growing high in trees either in dense forests or sometimes, close to the ocean. Description: Phalaenopsis amabilis is an single stemmed epiphytes. The thick, upright stem up to 8cm (3 inch) tall carry wide, fleshy, alternate leaves which are limp. The leaves are up to 30cm (12 inch) long and 10cm (4 inch) wide dark green with reddish undersides. 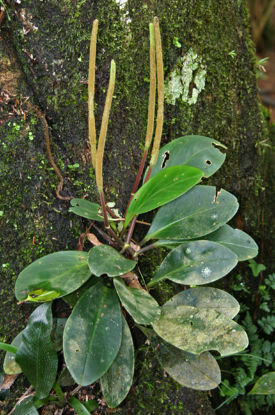 Some aerial roots are produced on the stem among the lower leaves. Similar roots cover the potting mixture. Arching flower stalk rise from the leaf axils can be 90cm (35 inch) long, with branches 30cm (12 inch) long. The flower stalk carry 20 to 30 flowers, each 10cm (4 inch) across. The pansy-like flowers in an inflorescence resembling a flight of moths are white, but the lip is spotted red with a yellow flush in the throat. Flowering occurs at any time and each flower lasts up to 3 weeks. Houseplant care: Phalaenopsis amabilis is actually quite easy to grow and adaptable. To extend the flowering period, cut back flower stems after flowers fade to just below the point where the earliest flowers appeared. New blooms will appear on side-shoots growing from this point. Light: Give Phalaenopsis amabilis bright filtered light throughout the year. During the short-day winter months some supplementary artificial light will encourage flowering. Temperature: A minimum temperature of 20°C (68°F) throughout the year is essential, along with high humidity. Stand the plants on trays of moist pebbles and mist-spray daily. Proper humidity for this lovely orchid is around 50 to 80 percent. By maintaining a temperature of 18-20°C (64-68°F) at night and 25°C (77°F) in the daytime for six – eight weeks, inflorescences will develop. In contrast, the inflorescence will not appear when the temperature is 20C (68°F) or more at night. Thus, the flowers are observed mostly in winter. Watering: Wilting caused by overly dry soil will set back the plant’s growth. Take care not to over-water the orchid, as it can develop root rot if its roots are left standing in water. Water the orchids moderately, allowing the top centimetre (0.4 inch) or so of the potting mixture to dry out between waterings. It is best to water in the morning. Never permit beads of moisture to rest on Phalaenopsis amabilis leaves. These orchids are susceptible to rot and fungus infections and black spots will appear if the moisture remains on them throughout a single night. Fertilising: Apply standard liquid fertiliser every two weeks or a foliar feed with every third or fourth watering. Potting and repotting: Use osmunda, bark or peat-based mixture. For good drainage put a shallow layer of clay-pot segments in the bottom of the pot. These orchids do well in wooden or wire baskets lined with sphagnum moss. Every two years move plants into slightly larger containers. After removing a plant from its container, clear the old potting mixture from the roots and cut away any dead roots before repotting the plant. Plants growing in maximum-size pots should be replanted in fresh mixture once every two years. Immediately after repotting them, move the orchids into a shaded position for about three or four weeks. Repot at any time that plants are not in flower. Propagation: Phalaenopsis amabilis can produce shoots at the base or in the joints of branches of flower stems after the season’s flowers have died. Leave growths on the plant until their roots are at least 2cm (0.8 inch) or so long. They can then be carefully cut away and planted individually in 8cm (3 inch) pots of recommended potting mixture. Keep each potted cutting in a warm in bright filtered light and water sparingly for the first six weeks. Thereafter, treat it as a mature plant. Problems: Failure for moth orchids to prosper in an indoor environment is most likely due to overwatering and insufficient light. Under high humidity and inadequate ventilation leaves are more susceptible to brown rot or bacterial disease, which produces brown watery spots on the leaves. This type of disease often develops on young leaves in early summer (rainy season). Treatment: An antibacterial agent is the only chemical that can effectively treat this disease. Anthracnose blackens the leaf apex and blotchy spots are rarely observed. Treatment: Fungicides are effective for this diseases. Spraying a chemical mixture of bactericide, fungicide and pesticide every one or two months is recommended in the wet season. Flowers can develop botrytis cinerea in low temperature and high humidity conditions. 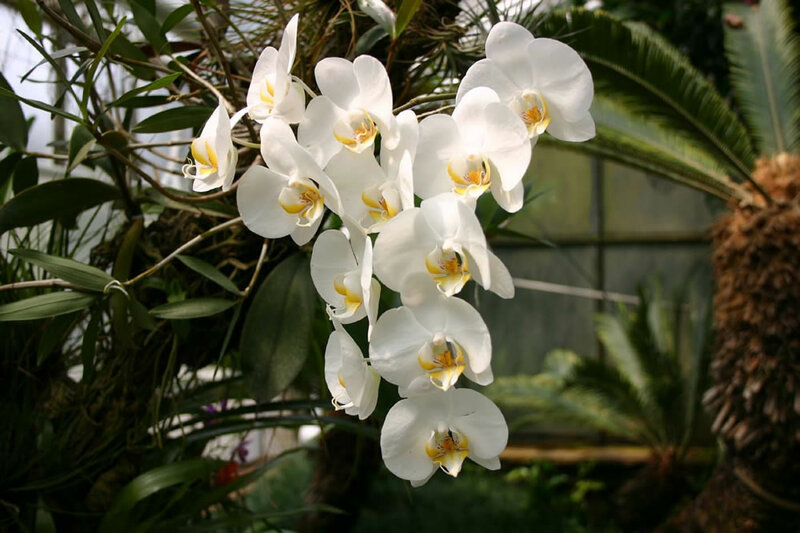 Uses: Phalaenopsis amabilis orchids have blooms that last for several months in the proper conditions. The orchid itself is very small but the flowers are relatively big and marvelous. With its beautiful flowers, this plant will surely enhance the beauty of the home and also purify the air inside the house. It said to remove VOCs (volatile organic compounds) and formaldahyde commonly off-gased from paints, solvents and other synthetic materials. The stems make nice cutflowers for bouquets, or the individual flowers can be used as corsages. The vase life of Phalaenopsis amabilis last for 15-60 days. Distibution and habitat: Homalomena wallisii is a perennial species of flowering plant in the Araceae family. It is tropical native plant found in humid climes of Columbia and Venezuela. It reaches about 15cm (6 inch) in height but with a much wider spread. Homalomena wallisii is an evergreen plant with simple leaves arranged opposite one to another. They are elliptic with entire margins. Spathes arranged solitary are followed by berries. Description: Homalomena wallisii is a very compact Aroid with ornamental leathery leaves. 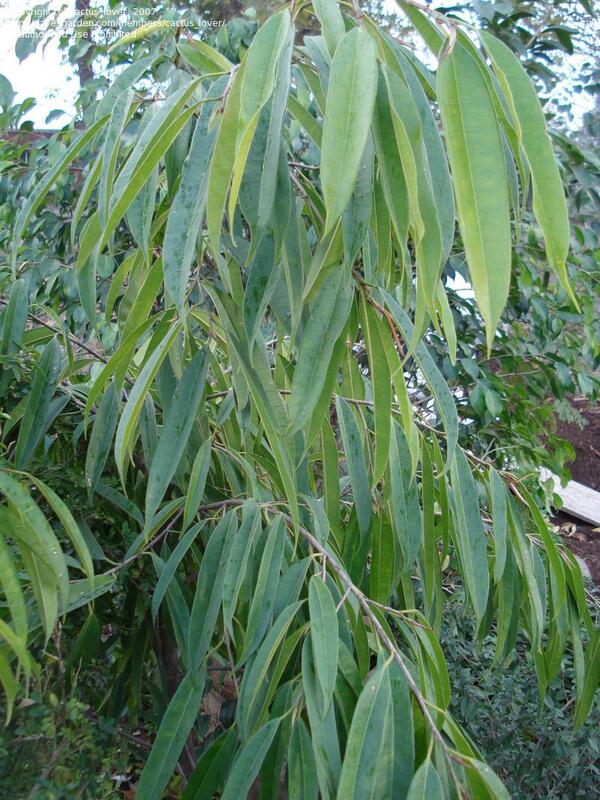 The broadly ovate-lanceolate leaves are of a deep velvety green with markings of a marbled yellow. The leaf blades are about 13-20cm (5-8 inch) in length, on rather short stalks, arching or recurving. 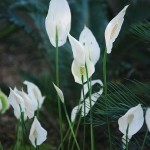 The spathe is quite inconspicuous, being of a yellowish white color, shorter than the spreading leaves. The plant grows to a height of 20-25cm (8-10 inch), forming a mass of foliage from underground stems. Houseplant care: Lush, tidy, clumping plant, Homalomena wallisii is a relatively easy indoor plant to grow with lovely, exceptional leaf shapes and colouration. Homalomena wallisii requires heat and moisture for its development, hence it is best for a terrarium when grown as a house plant. 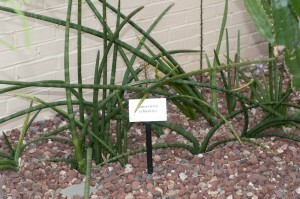 Light: Homalomena wallisii likes a partially shaded position when grown outdoors. 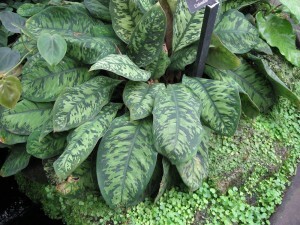 As houseplant it does well in medium to low light exposures but truly thrive in medium light conditions. Temperature: The warmest place in the house should be reserved for Homalomena wallisii. A suitable bay-window or a terrarium is best for Homalomena wallisii plants. Homalomena wallisii will require an optimal temperature of between 15- 32ºC (60-90ºF). It can withstand temperatures as low as 4ºC (40ºF) with little to no damage. Whenever the temperature climb over 18oC (64oF), it is a good idea to increase the level of humidity by standing the plants on trays of moist pebbles and spray them. Use soft rainwater to mist the Homalomena wallisii. Water: Homalomena wallisii love the moisture. Water plentifully as much as necessary to keep the soil thoroughly moist in active growing period. Empty the plant saucers after watering, as stagnant water could damage the roots. Dry soil will turn the foliage yellow and spartan. Fertilising: Fertilise regularly with a liquid plant food about every two weeks during the active growth period. Reduce feedings in winter. Potting and repotting: Use a soil based potting mix that retains water yet drains well. Move Homalomena wallisii into containers one size larger in spring. Homalomena wallisii do not have a deep root system and grow well in shallow pans or half-pots. Propagation: Homalomena wallisii can be propagated by division in spring when repot the plants. Carefully detach a section of rhizome bearing two or three leaves from the main rootstock and place it in a 5-8cm (2-3 inch) pot of moistened equal-parts mixture of peat moss and sand. Enclose the whole in a plastic bag and keep it warm in medium light until the new roots will develop. Then remove the new plant from the bag and treat it as mature Homalomena wallisii. Problems: No major insect or disease problems. Low humidity will cause browning along the leaf edges. If temperature is dropping below 4ºC (40ºF) the foliage of growing Homalomena wallisii plants may yellow or rot. An over abundance of sun will scorch the foliage – causing burnt spots on the leaves. Uses: Homalomena wallisii, although too tender for general use, makes a fine object for table decoration. It is suitable for pots or for group planting. This low-growing plant is also suitable for terrariums. Homalomena wallisii is proved to reduce ammonia levels as per NASA researches, so it is not only beautiful but also an efficient air-filtering plant for home. Notes: Homalomena wallisii can be confused with the rather similar Aglaonema. Distribution and habitat: Lantana camara is a species of flowering plant in the verbena family, that is native to the American tropics. It has been introduced into other parts of the world as an ornamental plant and the Lantana camara ended to be considered an invasive species in many tropical and sub-tropical areas. It can be seen in the wild and along footpaths, deserted fields, and farms. Description: In the wild this flowering shrub grows about 1.2m (4 feet) tall, but when potted they can be kept to about 25-40cm (10-16 inch) high by pruning. Lantana camara are generally sold in late winter or early spring when in bud and they are often thought of as temporary plants, to be discarded after flowering. This is a false impression, however. Lantana camara can be kept for years if they are proper pruned. The elliptic medium green leaves are up to 8cm (3 inch) long and 4cm (1.5 inch) wide, rough-surfaced and coarse-textured. Leaves have slightly toothed edges, have 1cm (0.4 inch) long stalks and appear in opposite pairs or whorls of three. 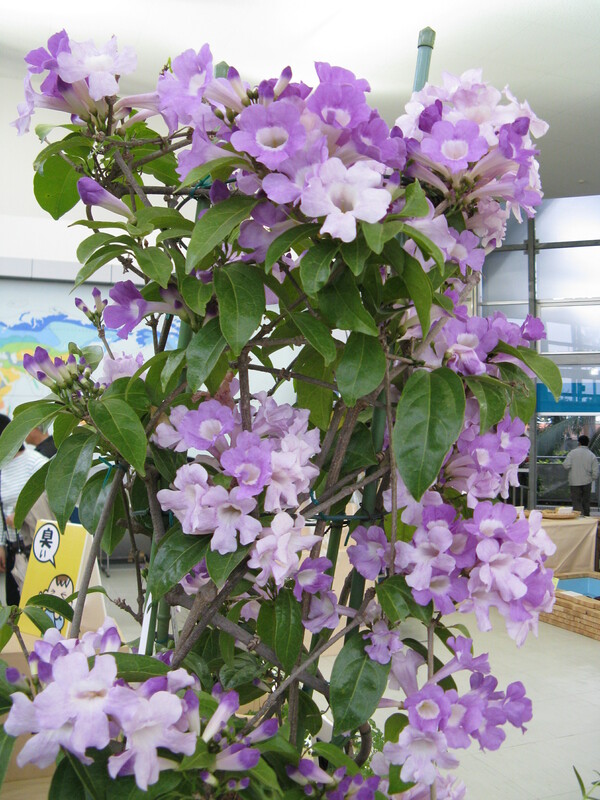 The flowering season lasts from late spring to middle autumn. Round 5cm (2 inch) wide flower heads are produced from the leaf axils on 5cm (2 inch) stalks. Each head consists of densely packed, tubular flowers. Individual flowers open successively, in rows starting from the outside of the circle. Whatever their colour, it changes (usually darkening) as they age. Thus a single flower head can contain blooms of two or three related colours – for instance, yellow, orange and reddish. There are a number of named forms with primarily white, yellow, orange, pink or red flowers. Houseplant care: Lantana camara needs low maintenance. Light: Grow Lantana camara in bright light with at least three hours a day of direct sunlight, all year long. If they have too little sunlight, these plants will not be able to flower. Temperature: Normal room temperatures are usually suitable from early spring to the end of the flowering period. But move the plants to a cooler position for a short winter rest at about 10°C (50°F), if possible. While Lantana camara are in normal room temperatures, it is a good idea to increase the humidity by standing the pot on tray with moist pebbles. Water: During the active growth period water the plants plentifully as often as necessary to keep the potting mixture thoroughly moist, but never allow the pots to stand in water. During the rest period water only enough to keep the potting mixture from completely drying out. Fertilising: Apply standard liquid fertiliser every two weeks during the active growth period. Potting and repotting: Use soil-based potting mixture. Move the small plants into pots one size larger whenever roots appear through drainage holes and on the surface of the mixture. Repotting may be necessary two or three times a year, but do not use needlessly large pots. Lantana camara flower best in pots that seem slightly too small for them. A 15-20cm (6-8 inch) size is the largest likely to be required for a small, bushy plant. When the maximum convenient pot size has been reached , symply top-dress the plants with fresh potting mixture every spring. Propagation: Propagate Lantana camara in mid-summer from stem cuttings. Take 8cm (3 inch) cuttings of non-flowering shoots immediately below a leaf, strip off lower leaves that might come in contact with the rooting medium and dip the cut ends in a hormone rooting powder. Plant the cuttings in a moistened equal-parts mixture of peat moss and coarse sand or perlite – either several together in a shallow seed tray or singly in 8cm (3 inch) pot. Enclose each container of cuttings in a plastic bag and stand it in bright filtered light. After rooting occurs (probably two to three weeks), uncover the new plants, water them sparingly and apply standard liquid fertiliser every two weeks.When the plants have made 5-8 cm (2-3 inch) of new growth, move them into direct sunlight. At this stage pinch out all the growing points to encourage bushy growth. Early in the following spring move cuttings rooted in 8cm (3 inch) pots into bigger pots of soil-based mixture and treat them as mature Lantana camara. Pot up the cuttings rooted in trays separately in 8 cm pots of soil-based mixture in early autumn and treat them as mature Lantana camara. Lantana camara is quite easy to propagate from seed sown early in spring, but the seedling that will result will be of mixed colouring and quality. Young Lantana camara rooted from cuttings are likely to flower more profusely than older plants. The young ones can be kept down to a suitable size for indoors use by having all their growing points nipped out when small. As Lantana camara plants age, they will generally retain their shape and much of their ability to flower freely if cut back to within about 10-15cm (4-6 inch) of the base in late winter or spring. 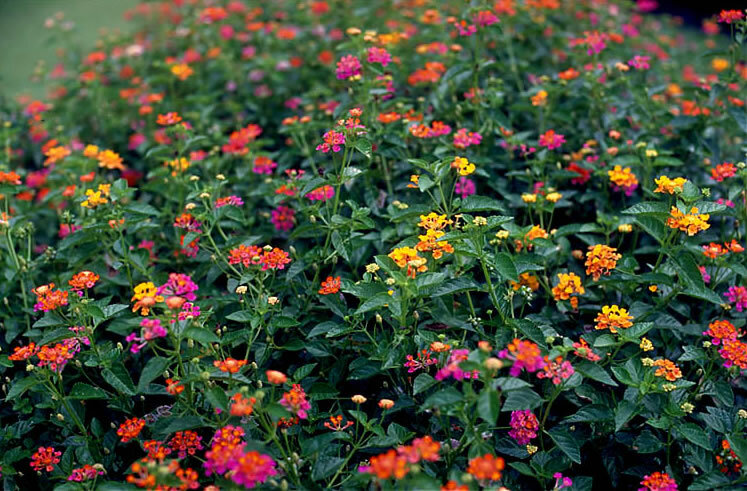 Culture: Lantana camara likes a moist, well-drained soil, but will tolerate a variety of site conditions. Lantana camara is very drought tolerant, but does not perform well in a wet site. Plant the Lantana camara in full sun. It will benefit by occasional fertilisation. Lantana camara are particularly susceptible to attack by whiteflies which tend to conglomerate on the leaves. Treatment: Use a suitable insecticide to combat these pests. Monitor the plants for black or brown patches or growths. These are sooty mold or powdery mildew growth, which are usually caused by over-watering or planting in shade. Treatment: Trim out any infected leaves or stems and dispose of them to prevent the fungus from spreading. 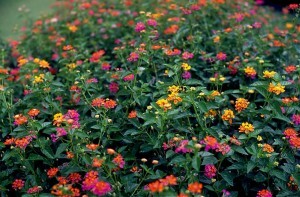 Uses: Lantana camara has become popular in gardens for its hardy nature. It is not affected by pests or disease, has low water requirements and is tolerant of extreme heat. Lantana cultivars favored as ornamentals tend to have small herbaceous stems. Lantana camara are tender perennials in hardiness zone 7 and may come back depending on the winter’s precipitation and temperatures. Plants can be used in mass landscape plantings, used in a mixed perennial border, as edging, in containers or hanging baskets and anywhere else there is a need for color all summer. When used as a shrub, plant as a hedge or foundation planting. Can also be used along banks. For a unique tropical effect, interplant Lantana camara plants with ‘Chartreuse’ sweet potato vine; the hot colors of the blooms blend well with bright lime green foliage of the vine. It is a favorite species of butterflies and used in butterfly gardens. Lantana camara can be used as a specimen. This houseplant brilliantly tolerates highly saline conditions, lack of water, scorching heat and billowing winds. 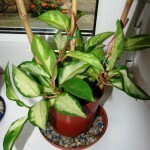 The leaves of this houseplant bear a very strong and pleasant aroma. At last but not least, Lantana camara is a houseplant that will purifies the air in house. 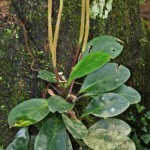 Distribution and habitat: Peperomia obtusifolia is a species of epiphytic flowering plant native to Mexico to northern jungles of South America and the Caribbean. It is an evergreen perennial growing to 25cm (10 inch) tall and broad, with cupped leathery leaves and narrow spikes of white flowers up to 12cm (5 inch) long. Description: Peperomia obtusifolia has long stems and flashy, glossy, rounded but blunt-edged leaves 8-10cm (3-4 inch) long. Leaf colour is deep purplish green and the stems are slightly purple. Maximum height is about 30cm (12 inch). White flower spikes only 5-8cm (2-3inch) long appear between late spring and early autumn. 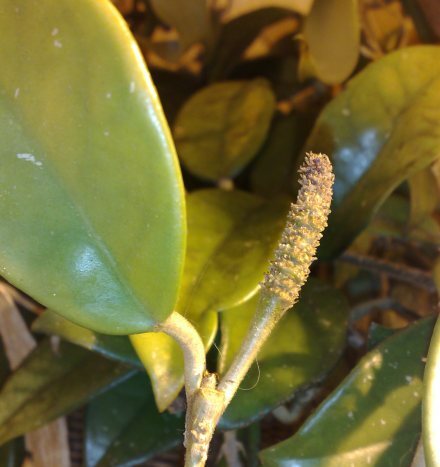 Houseplant care: Occasional pinching out of growing points during spring and summer will induce plants to produce more side-shoots and become bushier. 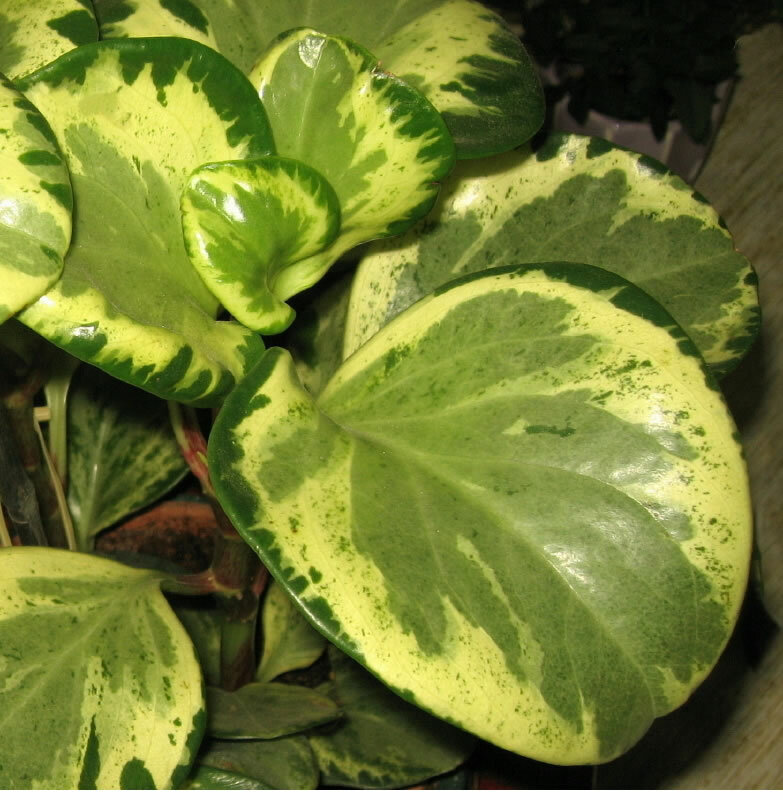 Light: Peperomia obtusifolia with green leaves need to be shaded from the hot sun during the sunniest months, but those with variegated foliage like a few hours of sunshine every day. There for these plants should be placed quite close to a bright window, especially in winter. 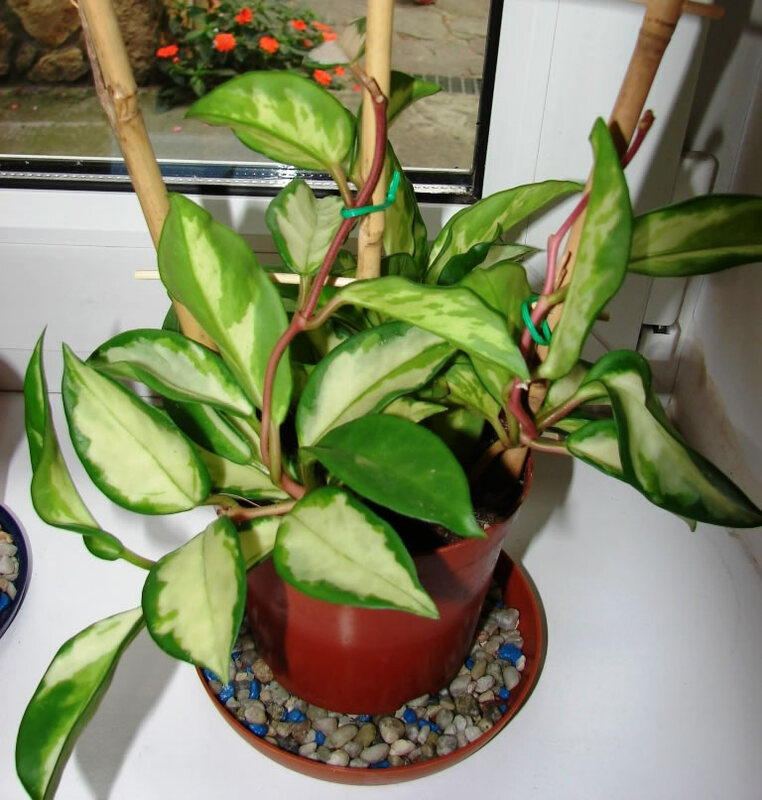 Temperature: Peperomia obtusifolia thrive in normal room temperatures. Even when not actively growing, they must have a temperature of at least 13°C (55°F). Despite of their appearance like succulents, they are not desert plants. They need high humidity during the growing season. In very warm rooms the plants will lose their leaves in dryness. It is recommended to keep the plants on trays of moist pebbles on in larger pots of damp peat moss. Watering: Water the plant only when is clearly needed and then very sparingly. Allow the potting mixture to dry out almost completely between waterings. Too much water even for short periods will result in considerable leaf loss and may even bring on complete collapse of the plants. The thick, fleshy leaves of these plants allow them to withstand short periods of drought. If at any time the leaves look unusually transparent, this probably indicates that the plant needs water. Fertilising: Apply standard liquid fertiliser once a month at half-strength from mid-spring to autumn only. Too much feeding will result in soft, untypical growth and eventually the plant will collapse. 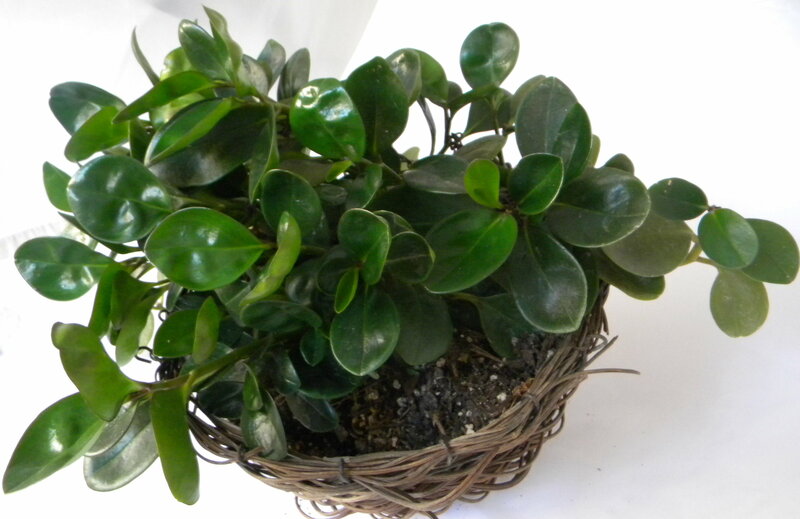 Potting and repotting: Peperomia obtusifolia best grown in a peat-based potting mixture. Because they have little root they will do well in small pots, half-pots, shallow pans, bowls and hanging baskets. Young plants may need to be moved into pots one size larger in spring. Mature plants in 10 to 13cm (4-5 inch) pots are unlikely to need repotting. All pots should have a shallow layer of clay-pot fragments or other drainage material in the bottom to promote drainage. Propagation: Peperomia obtusifolia can be propagated from 5-8cm (2-3 inch) long tip cuttings. Take cuttings in spring or early summer and insert several of them in same pot of 5-8cm (2-3 inch) with barely moist equal-parts of peat-moss and coarse sand or perlite. Keep the potted cuttings at a temperature of about 18°C (64°F) in bright light but not in direct sunlight and water them very sparingly. 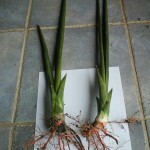 Tip cuttings are likely to root in four to six weeks. Move the rooted new plant into larger pots only when they have completely filled their pots with roots and clearly need more space. 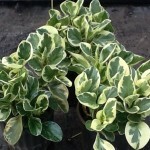 Peperomia obtusifolia ‘Alba’ is a variegated form with pale lemon yellow new leaves, deepening in colour as they age. 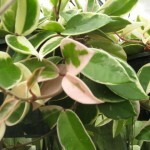 Peperomia obtusifolia ‘Albo-marginata’ is a variegated form with silvery white borders on a grey-green leaf. 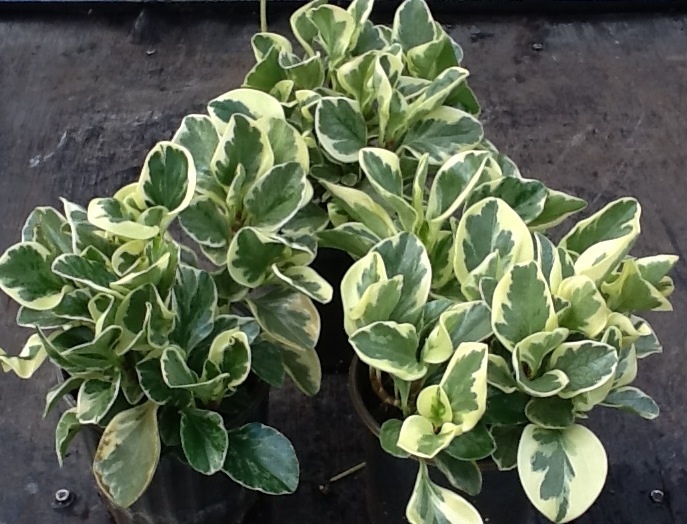 Peperomia obtusifolia ‘Variegata’ & Peperomia obtusifolia ‘Greengold’ are both variegated forms with patches of cream or yellow. Peperomia obtusifolia ‘Minima’ is a dwarf form of Peperomia obtusifolia. Peperomia obtusifolia is susceptible to grey mould (botrytis) that may appear at the base of the stems if the air is too stagnant. Brown-tipped leaves may be caused by sudden drops in temperature. Treatment: Keep the plant in well ventilated place to avoid grey mold to appear. Remove the affected leaves immediately and always keep the plants away from droughts and cold window-sills. Overwatering will result in wilting or discoloured leaves or/and stems and leaf root. Uses: Peperomia obtusifolia is used in terrariums, mixed planters or in shelves by warm, sunny window. These houseplants clean the air by emitting high oxygen content, and purifies indoor air by removing chemicals, such as formaldahyde or other toxins.